Update: Exclusive Cloudways Coupon Code 2018 – FLAT 20% off!! 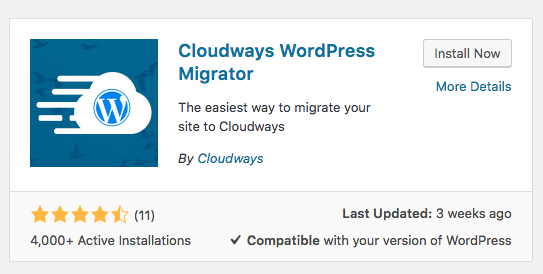 One more reason to start or migrate your WordPress site to Cloudways. 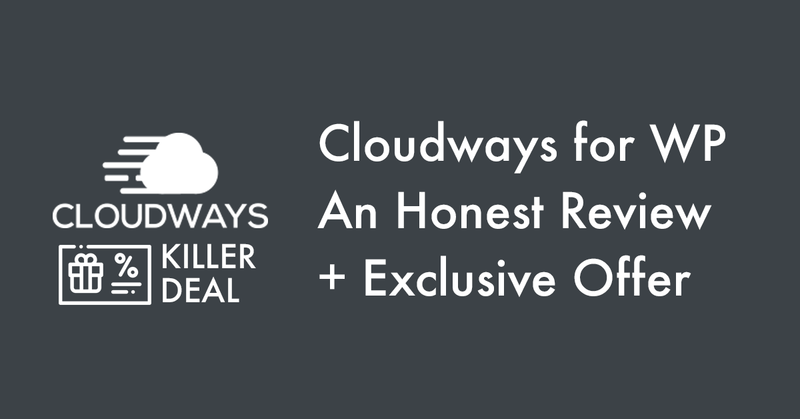 I’ve teamed up with Cloudways to bring you an excellent and exclusive deal. Use the coupon code “MIGHIL” to get a FLAT 20% discount on the first invoice. Offer applies to all plans. This one’s a killer Cloudways promo code if you’re selecting a small or medium-sized server to host your WordPress site. Click here to sign-up & use the promo code MIGHIL. This Cloudways promo powered by Mighil.com is a limited time offer valid for three months starting from September 19, 2018. Hurry up and take advantage of the best Cloudways coupon for 2019. 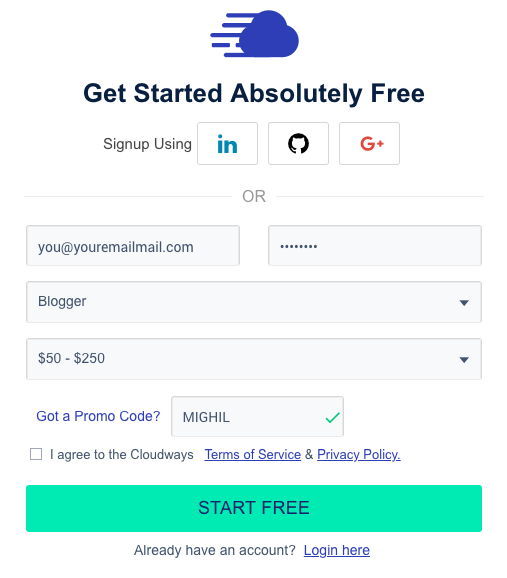 Mighil.com’s exclusive Cloudways coupon code gives you FLAT 20% off on your first invoice independent of the servers you choose. Follow the instructions below to redeem the coupon code and get a fair discount while signing up with Cloudways. Visit this link to land on the Cloudways sign-up page. Click on Get Started Free and it’ll lead you to the sign-up form. New to Cloudways managed cloud web hosting platform? Not sure if it’s the best choice for managing your WordPress site(s)? Read this blog post before investing your time and money on Cloudways. TLDR; Yes, it is one of the best WordPress hosting platforms. Read the backstory, will you? Then we’ll jump to the review. I’m very picky but straightforward when it comes to recommending stuff to friends and peers. I’ve tested a handful of dedicated Cloud hosting (VPS) services to date. I’ve been a DigitalOcean user for years before switching to BandWagonHOST and NameCheap hosting. BandWagonHOST is quite cheap, and they provide OpenVZ & KiwiVM based plans. The downside? You need to have intermediate skills in managing virtual private servers. It’s not for the faint-hearted. I loved every bit of managing own server and setting up multiple WordPress sites on BandWagonHOST. It was fun while it lasted. I left BandWagonHOST just because the servers were getting slow for the mainland Chinese audience. I hosted a few projects for Chinese clients on BHW, but the performance got worse (even with a Cloudflare CDN). Things were going south, and I needed a quick solution. NameCheap came to the rescue, temporarily. 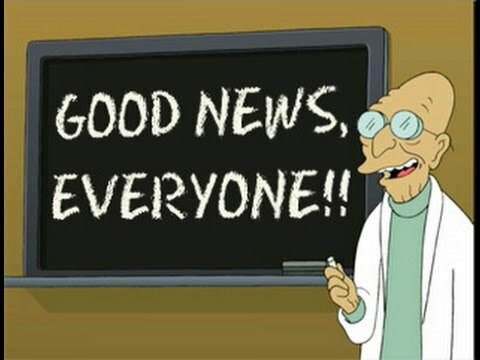 Quite frankly, cPanel isn’t my thing, so I left NameCheap in a few days and got a 100% refund. I visited my hometown in India last June for work related reason. Anvar at Mozilor suggested Cloudways and said they’re using Cloudways for years. I never thought of giving it a try since I was quite happy with my highly flexible BandWagonHOST server during that time. His suggestion came on my mind while researching for a new host. 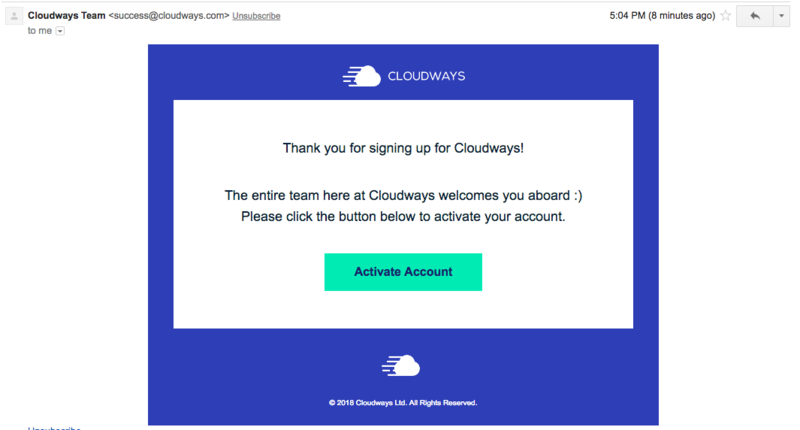 Signed up and tested their service, really liked it, and now I’m with Cloudways. 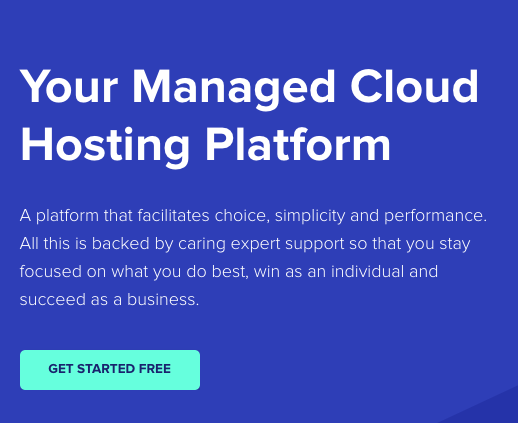 Unlike the widely used consumer-friendly options like Bluehost, HostGator or Siteground, Cloudways adds the DIY touch to the WordPress hosting scene by bringing together an innovative, scalable, budget-friendly managed hosting platform with rich features and 24x7x365 support. Their newly redesigned website looks sleek and comes with a neat UI. With Cloudways, you can spin up “pay as you go” servers based on DigitalOcean, Vultr, Linode, Amazon AWS or Google Cloud Platform. Apart from that, Cloudways platform comes with handy performance-boosting technologies, including PHP7, Nginx, Redis, Memcached, Varnish, HTTP/2 and add-ons like DNS Made Easy, Rackspace Email, Elastic Email, CloudwaysCDN and more. As you can see, Cloudways is a “Pay As You Go” platform; meaning, you will pay only for the resources you consume. You can either bind a credit card to automate the billing or use PayPal to add funds. DigitalOcean – Starting at $10/month. Linode – Starting at $12/month. 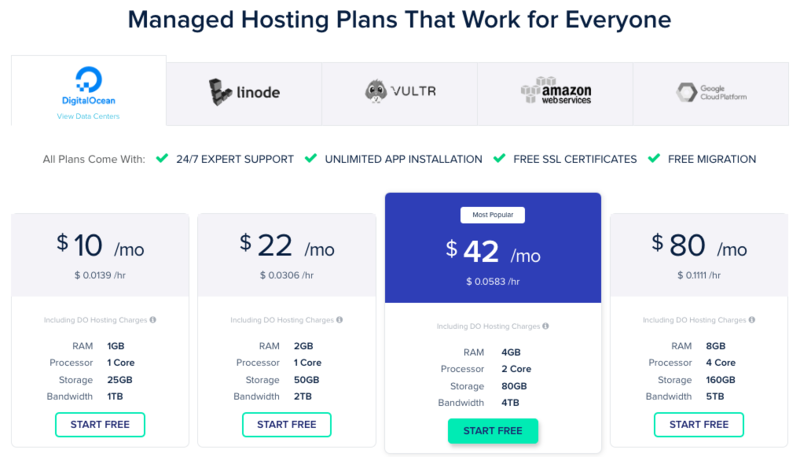 Vultr – Starting at $11/month. Google Compute Engine – Starting at $34.17/month. Amazon Web Service – Starting at $36.04/month. You can Get Started for FREE using a valid email ID or with LinkedIn, GitHub or Google+ accounts. Keep in mind that they’ll ask for a working phone number (not a VoIP or Google Voice number) during registration. Also, note that you have to initiate a chat with customer support to start your 3-day free trial without a credit card. It took about 15 minutes for Cloudways to review my account. 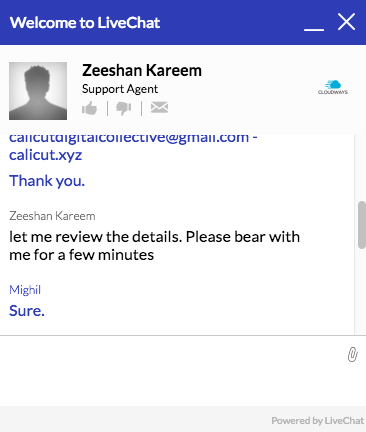 Here’s the screenshot of the conversation I had with Zeeshan at Cloudways. The customer support team will ask you to provide the email ID and website URL (not mandatory) for initial review. Later, they will send you a confirmation email to activate the account. The whole process was smooth, and you can create a new WordPress application right away for testing. “Need a Hand” button on the right side will open Help Center, which will be a goldmine for beginners to managed hosting. Click LAUNCH NOW after choosing the application and server details. The Cloudways platform assures high-speed performance, managed security and expert support. Above mentioned are the essential factors to look for when you’re purchasing a managed hosting service. Let’s look at the key features. I have experience managing servers at a root level. 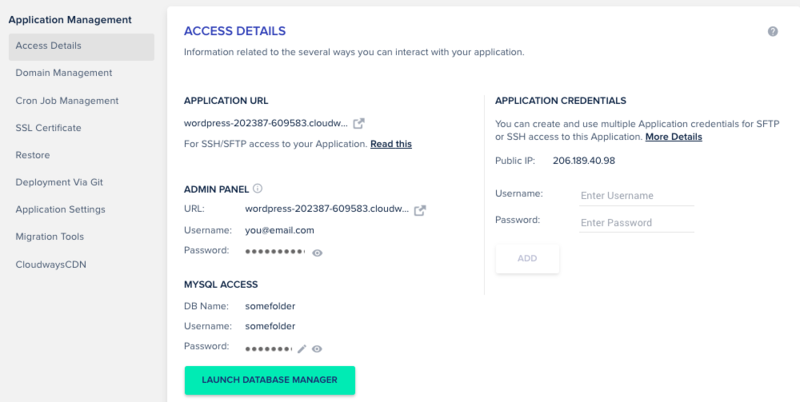 Even though Cloudways doesn’t provide root access, they offer a wide array of performance boosters essential for WordPress applications. All Cloudways server are PHP 7.x ready, which is known to be significantly faster than its predecessor. 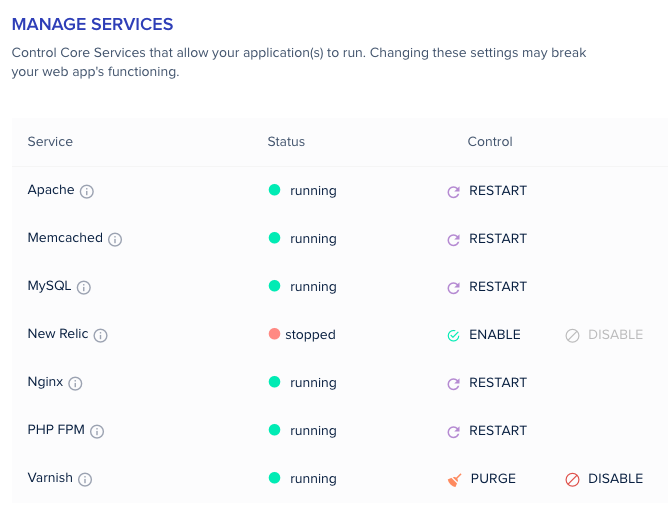 Cloudways also give you the option to Control Core Services that allow your application(s) to run. You can optimize it now and then if you know what you’re doing. Cloudways platform now comes with CloudwaysCDN, a new powerful and straightforward service that delivers superior performance and excellent global response times. It can be integrated quickly and will significantly improve the speed of your WordPress website. Auto-healing lessens your worries about website crashing or downtime. Cloudways is equipped with auto-healing and comes to site’s rescue. Breeze; the WordPress plugin engineered by Cloudways team offers better WordPress performance boosting comparing to other cache and performance plugins. Breeze WordPress plugin comes pre-installed on Cloudways. Enabling Redis improves the performance of databases. Combined with Apache, Nginx, and Varnish; you’re looking at unbeatable performance. PHP-FPM speeds up your website and improves the loading times of your PHP environment. Security is essential even if you are running a personal website or a professional blog that attracts a fair amount of traffic. Cloudways platform is equipped with security practices to keep your servers safe. According to the Cloudways, all servers hosted by Cloudways are protected by OS-level firewalls that filter out malicious traffic and keep out the intruders. Cloudways platform comes with built-in Let’s Encrypt SSL. It also lets you add your SSL certificates easily with few clicks. The Cloudways platform lets you create a whitelist of IPs, making it easy to collaborate with networks or regions with unrestricted access to SSH and SFTP. Cloudflare claims they perform regular OS patches and firmware upgrades on servers. Security patches ensure a robust managed cloud server experience by avoiding vulnerabilities. Two-Factor Authentication (TFA) adds an extra layer of safety to your Cloudways account. Adding a WordPress application is pretty straightforward on Cloudways. 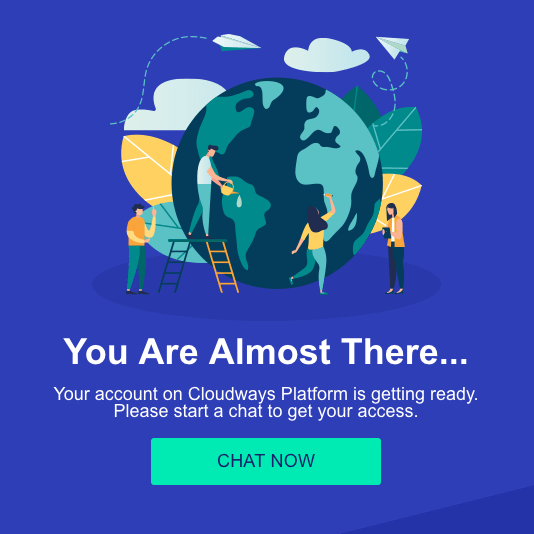 Visit https://platform.cloudways.com/apps and click on + Add Application button to add a new app to the server. You can set a primary domain, install Let’s Encrypt SSL certificate (including wildcard SSL) and optimize the site afterward. This console is pretty intuitive. 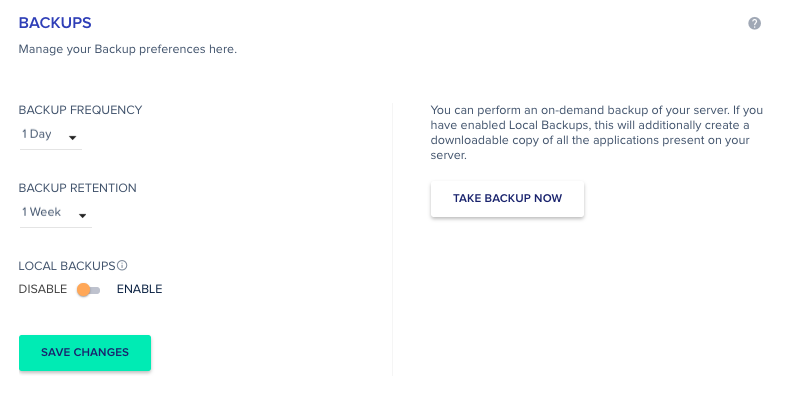 You can perform an on-demand backup of your server via the console. 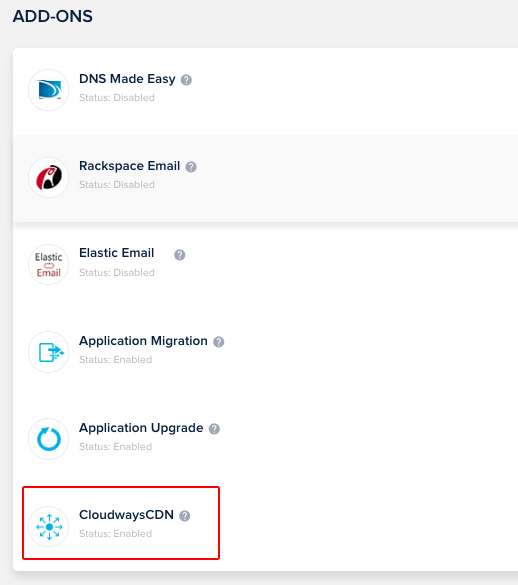 Cloudways console also has an option to enable Local Backups; this will additionally create a downloadable copy of all the applications present on your server. Cloning/staging is a great beta feature Cloudways providing for its community. Cloudways lets you create staging apps and move data between staging and live applications. Cloudways provides a decent migration tool to move the site from your old host to Cloudways platform. I’ve already written an article on this topic. You can read it here if you’re planning to migrate a website with SSL enabled. Cloudways provides performance graphs on various aspects of your server. They have partnered with Newrelic to offer built-in App Monitoring as well. You can enable New Relic agent in the Services section of the console. Yes, support should be a priority while choosing a cloud platform for WordPress. You don’t want to end up in the hands of a service provider that doesn’t respond to your queries and concerns promptly. Cloudways customer support team are the best, period. You can talk to the Customer Success Team via live chat, or submit a ticket through the ticketing system. They’ve recently launched a community website as well. Their Knowlege Base is well-documented also. Most articles are beginner friendly and reminded me that of NameCheap’s KB articles. How good is Cloudways support? No. A credit card is not required. However, you’d only have three days to test the platform. Can I have servers on separate pricing plans and different cloud providers? Yes, you can launch multiple servers of the same or different cloud hosting plans and providers. It is entirely up to you. There is no restriction on the number of apps you can start on a single server. However, plan well according to your server specifications. What if I exceed my bandwidth? Bandwidth is calculated based on the provider you select. 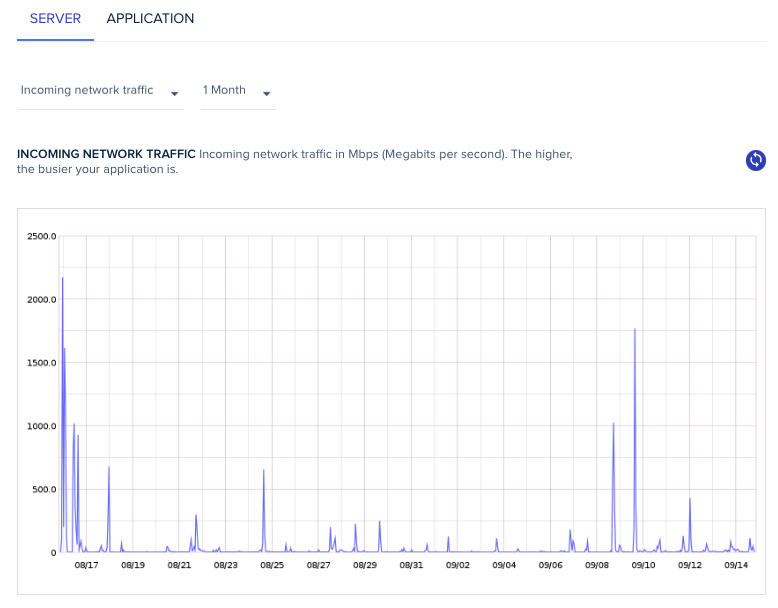 On Amazon and Google servers, bandwidth billing is on demand at all times. Vultr charges $0.02 to $0.05 per GB for additional bandwidth usage (varies with data center region). DigitalOcean charges $0.02 per GB for additional bandwidth usage. How to cancel Cloudways account? Cloudways is a “Pay as you go” platform. You can cancel the account by deleting your servers anytime, and you only need to pay for what you’ve used. I am familiar with DigitalOcean, and I love using Cloudways as a platform because it’s flexible and transparent. I can add my clients for billing and even add team members for collaboration. The platform is quite intuitive so that I can teach my clients’ very basic stuff without taking 100% responsibility for the project. Cloudways is ideal for professional bloggers and small to medium-sized companies as well. If you are skeptical, go ahead and test the platform for three days. Get Started With Cloudways for FREE!